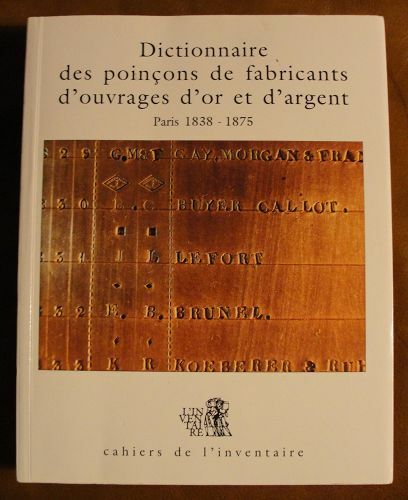 Offered is a very fine, almost unused copy of what has gotten to be an impossible-to-find foundational reference work on Parisian silversmiths - Catherine Arminjon's "Dictionnaire des poincons de fabricants d'ouvrages d'or et d'argent Paris 1838-1875". Arminjon also published a volume on Paris silversmiths prior to 1838, and both of her books on Paris silversmiths have become very expensive since they went out of print fifteen or twenty years ago. The only copy of this book available on Amazon or elsewhere is listed at $750, and my volume is in better condition and less than half the price. This example is in near new condition with no meaningful defects, and the pictures are of the actual book. The details follow below. All in all an excellent reference at a bargain price! Description: Fine. Quarto. 440 pp; b/w photos of nearly 4, 000 gold & silver hallmarks indices of symbols, surnames, and street names; bibliography. Text in French. "Hard" softcover. A fine, unused copy; no markings. The most comprehensive catalog of French hallmarks for this period.